As hundreds waited in line to order the Tesla Model 3 this morning, some got a surprise visitor... it was none other than Tesla Motors [NASDAQ: TSLA] CEO Elon Musk. Many received high fives and heartfelt a "thank you" from Musk as he happily greeted those waiting about to reserve the new Tesla Model 3. Elon Musk looked thrilled to see his vision manifesting right before his eyes. Thousands around the world put down their deposit for the first-ever mass-market Tesla. 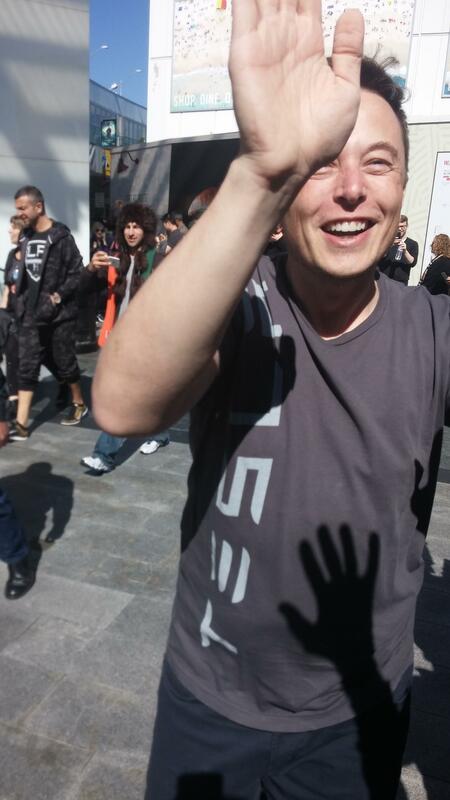 Take a look at some candid shots of Musk as he greeted those in line for the Tesla Model 3. Keep in mind -- these folks were putting in a deposit sight unseen. Sure... it's one thing to wait in line for an iPhone that's a few hundred bucks, but it's another thing to wait in line for a car (with no idea what it looks like) that costs $35,000 and up! And, we'll have to wait for at least 18+ months to take delivery of the vehicle. That's faith in this amazing company and its trailblazing CEO, Elon Musk. In addition, Elon Musk has been tweeting up a storm today, and, there's lots of news. Here are some of Musk's updates thus far: "Adding several more countries to Model 3 order page tonight. Check for details, but will include India, Brazil, SA, SK, NZ, Sing & Ireland." And he added some logistics for tonight and kudos for in-store orders: "Online ordering at Tesla.com will now open at 7:30pm Pacific to ensure no server overload. Presentation still at 8:30... Model 3 orders, whether in store or online, are limited to two per person... Incredibly inspired by the interest in Model 3. You won't be disappointed. Also, small token of appreciation coming for those who lined up." Lots of exciting news coming, we're heading off to the event super-early so stay tuned for more news and updates. I'm planning to do a round-up up of all the key news post-event before I go to sleep tonight. Then, I'll be flying back to Florida first thing tomorrow morning. One thing is for sure, Model 3 mania has begun.